A hole-in-one is a dream score for a golfer. Unlike many other aspects of golf, a hole-in-one is "available" to low handicappers, beginners, high handicappers, men, women and young golfers. Another piece of good news: While some of the rules of golf can be a bit complicated and need some translation, a recognized hole-in-one is quite simple to verify. Here is a brief explanation of the rules. If you're a high handicapper or a beginner staring at a short (325 yards or less) par-4 golf hole, a hole-in-one is probably not in your future. However, a 165-yard, par-3 might be a candidate. On most 18-hole rounds of golf, you'll typically face four par-3 holes, two on each nine. While a hole-in one should never be a realistic goal, the potential on a shorter par-3 hole is at least a possibility. Your chances of making a hole-in-one are typically not related to your skill level or how many times you play golf. The rules specify that you should hit the ball from a standard or "recognized" tee box. The rules also require that you hit the ball from the normal tee or a club-modified tee that is recognized by the USGA (United States Golf Association). You must play a round of at least nine holes to qualify. Rushing to your course after work at 7 p.m. and playing five holes before dark will not qualify, even though you may enjoy the thrill of a tee-to-green hole out. Also, even if you play the minimum nine holes, but as a "practice" round (using two or three balls), you cannot score a USGA-recognized hole-in-one. You must play one ball only. While you aren't required to land on the green on your tee shot, there are a couple of rules that affect the hole and pin placement. 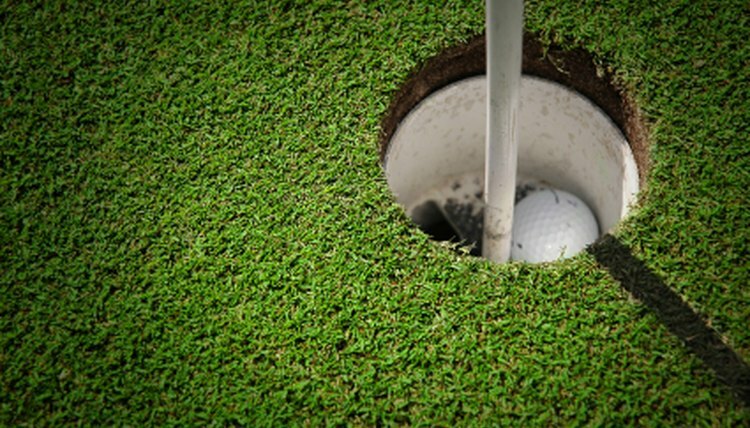 For example, should you make your hole-in-one on a "temporary" green (installed when a permanent green is undergoing rebuilding, relocated after a bout of serious and heavy rain, or sometimes used in the spring in colder climates to protect the permanent green for summer play), your hole-in-one is still valid. However, if there is a group ahead of you, they cannot hold, touch or manipulate the pin in any way. The basic rule that you must play at least a nine-hole round has one primary exception. If you are using match play (winning, losing, or tying your opponent on each hole) instead of stroke play (adding your total strokes, including handicaps) to decide the outcome of the game, you may not get to finish the full nine holes before the match is decided. For example, you win four of the first six holes while tying the other two. You are ahead by four with only three holes to play. You are the winner, 4 and 3, and the match is over. Should one of your winning holes include a hole-in-one, it will still be recognized, even though you didn't finish nine holes. If you complete nine or 18 holes but play alone with no partners, you cannot make a recognized hole-in-one. You become similar to the solitary fisherman who hooks the biggest fish on the planet, but no one is there to see it. Someone must be with you to attest to witnessing your hole-in-one. Also, that someone must be acceptable to the USGA. For example, if your 4-year old son or daughter is with you, it could be a challenge to verify and validate your shot. You would have to settle for the personal satisfaction of making a once-in-a-lifetime shot without official recognition. Should You Lose to Your Boss in Golf?